Storm chasing, tornado chasing, tornado pictures, for the storm chaser. The 2008 storm chasing season has been an active one, especially in my home state of Iowa. We've witness the loss of life from several of the tornadoes that struck the state this spring, especially in the Parkersburg area. Out thoughts are prayers go out to those impacted by this weather. Nobody is immune to the whims of nature. What we've come to reply upon day after day in our normal lives can all change in a matter of seconds. My mind is on this topic because yesterday morning around 5:15am, an EF2 tornado hit the small, sleepy town of Attica, Iowa. Attica is one of those places you might never notice, because you drive past it in less than 20 seconds. But for me, it had a rich history. My mother attended school there. My grandfather worked in the numerous coal mines during the early 1900s through that area. My uncle built a house there, my stepbrother had a farm on the south side of town, etc..etc. Well, most of that is gone or destroyed now, along with a barn that my stepbothers and I played and work in when I was a youth. By the way, I have a few of my photographs available on THIS WEBSITE if you'd like to look at them. Allow me a quick side detour here.. I'd like to thank all of you folks for visiting stormchase.us throughout the years. We continue to set record for visitors and bandwidth usage. Recently we had to move to a different server to handle the bandwith. Look for some new updates to the site, along with new tornado movies in the near future. Say what you will about weather and the continuing debate about global warming. I can attest from personal observations over 45 years that the weather in Iowa has changed since my childhood. The types of storms we see today are different. One theory I've had has been the increased density of crop production in our state, and the resultant rise in evapotranspiration, which artificially modulates our dewpoints during the summer months, effectively placing us in a tropical air mass. My thoughts and prayers go out to all the victims of storms and other natural disasters. I might document them, but I've also seen first-hand the toll exacted on people's lives. There has been quite a debate raging in the media and among storm chasers regarding the amount of vehicular traffic and 'chaser convergences' during significant severe weather outbreaks. Ever since the movie 'Twister' came out (coupled with increased media coverage), I've observed the traffic congestion first-hand. All I can say is drive safely, use common sense, and pay attention to the direction of local law enforcement. Severe weather affects people's lives. Their world can be shattered in mere seconds. Local police, fire and rescue personnel can easily be overwhelmed after a severe weather event. Thanks to everybody who visits this site on a regular basis! 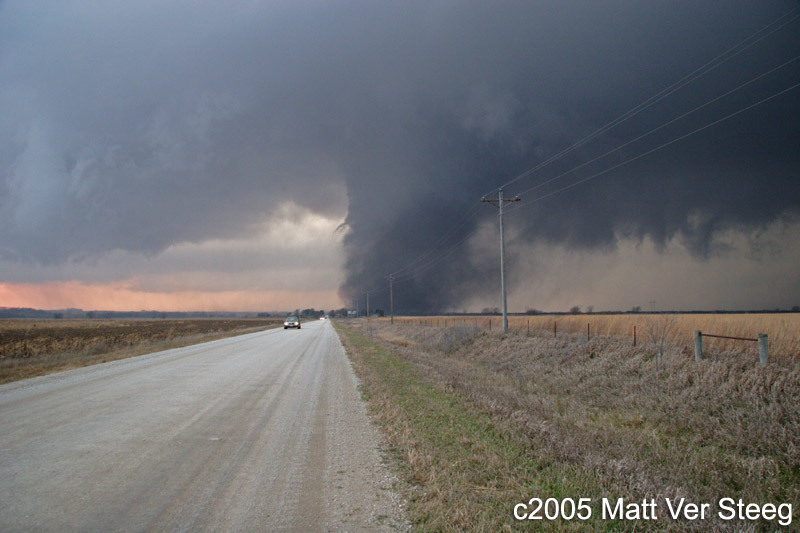 We captured several tornado pictures during the 2003 chase season. See them HERE. Our main photo gallery features pictures of tornadoes, lightning, and severe thunderstorms. Matt is also a musician, and has written several songs, available on iTunes. Check them out! Portable radars for storm chasers. Are they really needed? Who can chase storms? Nobody? Anybody? Your ferret? How many toys and expensive doodads do I need to get pictures of tornadoes? What's tornado chasing all about, anyway? Images and articles © 2009 Matthew Ver Steeg, Adam Frederick, and Weather Edge, Inc. All rights reserved.